Are you considering to convert your principal place of residence (PPOR) to investment property (IP) so that you can enjoy the benefits of negative gearing while making use of the ATO "six year rule for CGT" to avoid or reduce CGT when selling your PPOR? 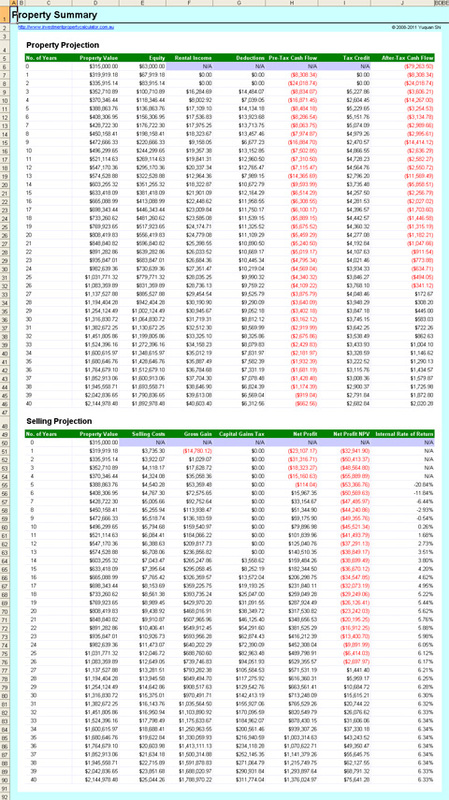 This PPOR to IP Investment Property Calculator is built to show you the benefits of negative gearing as well as the implications if you sell the property at a certain time by considering the 6 year rule etc. You and your wife bought an apartment in Wolli Creek, Sydney in June 2007. You renovated it and lived in there until July 2009. In July 2009 you were assigned to the UK for work and you rented it out until you returned to Sydney in May 2011. You potentially will be assigned to overseas agin in the near future. You have just commissioned a quantity surveyor to undertake a depreciation report. You would like to take the data from that report and use it in an investment property tracking spreadsheet or calculator. On the basis of the dates you input into the investment property tracking spreadsheet or calculator, you'd like to be able to look at the capital gain tax (CGT) liability using some simple assumptions. For example, assuming you don't currently own a second property and are still claiming the house in Wolli Creek as your POPR, you'd like to see what it would mean to sell at a certain date and an assumed selling price and selling costs. You in addition would like to understand what impact the depreciation etc would have on capital gains if you sell outside the 6 year rule period. You wonder if there is a calculator that can help you in answering the above questions? 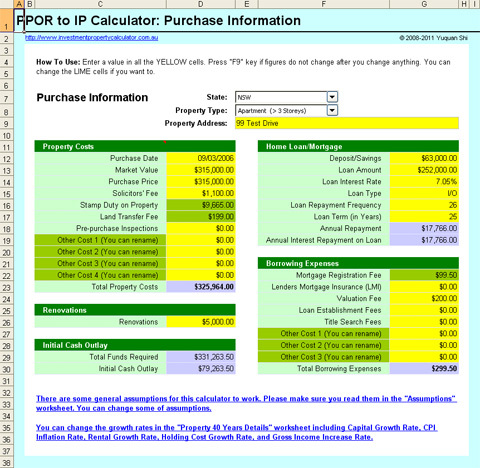 The answer is "YES" and the PPOR to IP Investment Property Calculator can help. 1. Allows changing tax rates, stamp duty rates etc. 2. Allows multiple move-in and move-out simulation (up to 8 times). 3. Allows rental information & cost input. 4. Allows selling information input. 5. 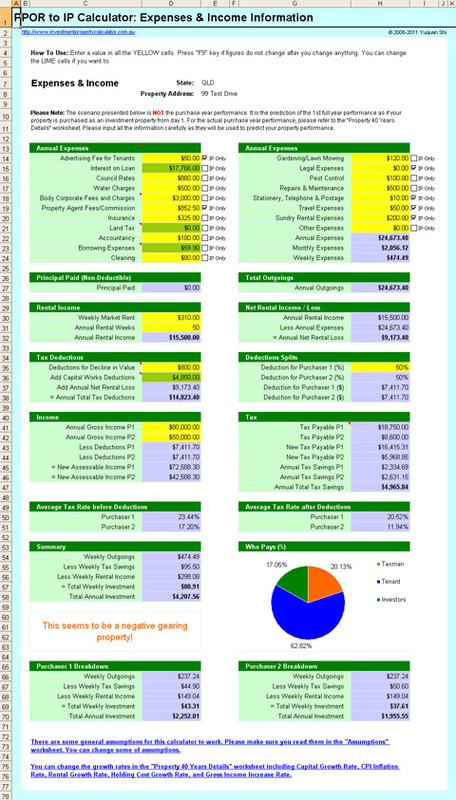 Shows a 40 years summary report. 6. Shows year to year details over 40 years. 7. Allows entering the depreciation schedule. 8. Allows estimation across all states in Australia. 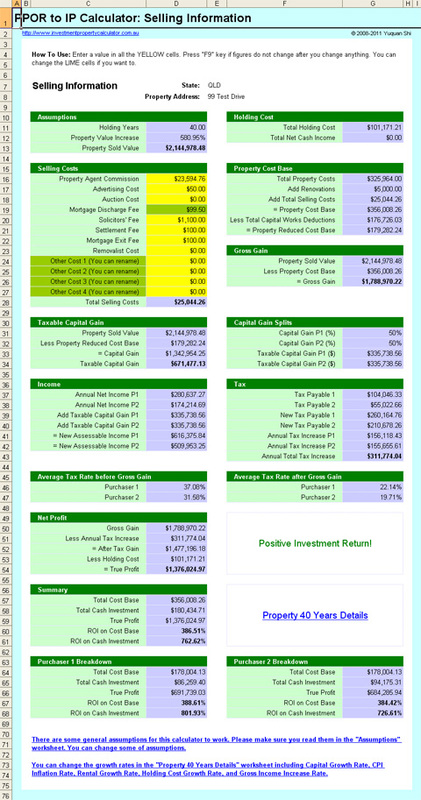 Here is a screen shot that will give you a better idea that what you need to do and how this PPOR to IP Investment Property Calculator may help you.